The Hudson Square Connection (HSC) is the Business Improvement District (BID) for the Hudson Square neighborhood, bounded by Canal street on the south, Houston street on the north, 6th Avenue on the east and Greenwich street on the west. Our mission, in part, is to put Hudson Square on the map by capturing the spirit of innovation that is thriving in the commercial spaces and bringing that energy into the public realm. The Hudson Square neighborhood is home to more than 50,000 people working in more than 1,000 firms in advertising, design, media, communications and other cutting edge businesses. Our daytime population is estimated to be almost 70,000 people. We are adjacent to the densely populated neighborhoods of Soho, the West Village and Tribeca. 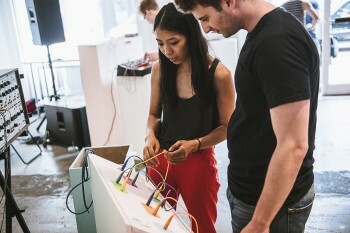 This two-day event in Lower Manhattan’s Hudson Square neighborhood showcased its evolution from New York City’s historic printing district to a fast-growing hub for tech and design. Highlights included comedian Todd Barry headlining a panel on the podcasting boom, a free workshop where you could learn to compose music with modular synthesizers, an evening of rapid-fire talks with top designers, and live 3D printing of objects like benches and bird houses in lobbies across the neighborhood. PKPR secured coverage from The New York Times, New York Daily News, Metro New York, 6sqft, DNAinfo, Downtown Magazine, New York Business Journal, am New York, and a special feature by Untapped Cities highlighting the history of Hudson Square’s historic buildings.